As Christmas approaches, I am still painting at the lagoon and loving it! My last workshop for the year is happening next month, 24 & 25 November. ‘Capturing the Spirit of Place’ will be a wonderful opportunity for you to learn new skills, meet like-minded people and have fun. A year’s work culminates in this new exhibition. I’d love you to come and see these paintings of Glenbrook and Huskisson Lagoons. Lately I have challenged myself to get more embarrassed, uncomfortable, even scared - to stop using familiar methods and rather to explore uncharted tracks, that possibly lead nowhere in particular. What do you do when your trust is betrayed? It's a cliché, but it's true... 'pictures tell a thousand words'... so I give you a story in paint. When I travelled to South Africa recently, I was captivated and inspired by the landscapes of my childhood. I returned home with a portfolio filled with images, sensations and ideas to explore in my studio. I’m always saying to my kids, ‘You are the driver of your life…’ yet somehow recently I felt like I’d climbed into the backseat. Perhaps you have also been through times of feeling blue, unmotivated and numb – an observer of your life rather than an active participant? Do you wonder what to say to your child when he shows you his drawings? How to encourage your daughter as she gets frustrated with paint? Read this - it may just help! 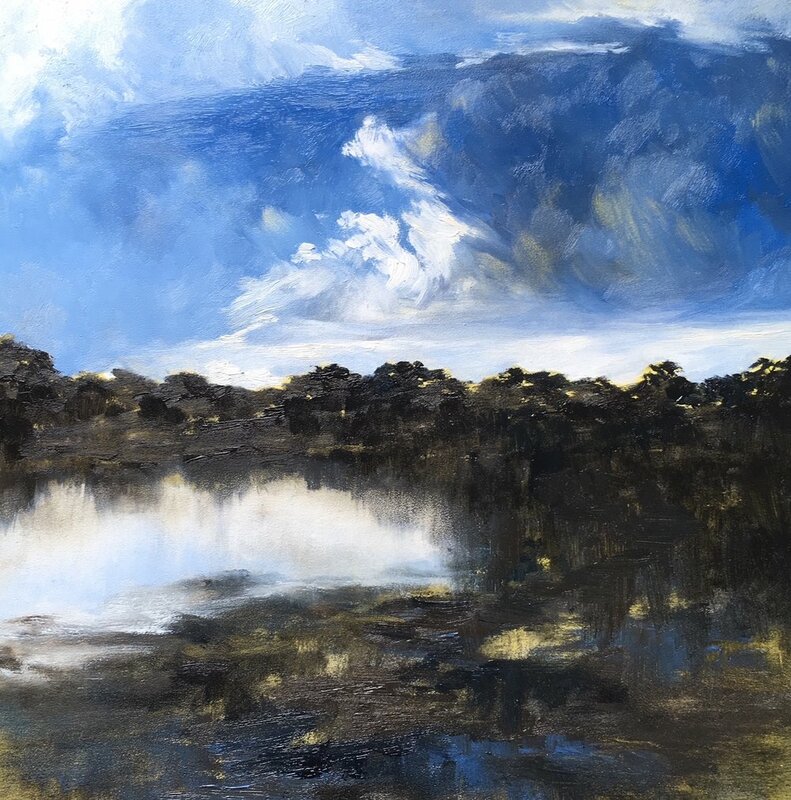 The paintings in this show have been inspired by many hours spent at Glenbrook Lagoon and a number of sojourns to Huskisson. Glenbrook lagoon settles my wandering spirit, providing a place of rest and repose. I love to draw here, searching out the forms and textures, allowing my charcoal to explore, meandering freely across the paper. As I contemplate the enormous trees on the shoreline, the words of the African American spiritual come to mind, ‘like a tree planted by the rivers, I shall not be moved…’ They stand like guardians of the lagoon, timeless sentinels protecting a precious oasis. In contrast to the stillness and constancy of Glenbrook Lagoon, Huskisson Lagoon, on the shore of Jervis Bay, is an ever-changing tidal estuary. The shifting sand banks, shimmering reflections and vast skies captivate my imagination, urging me to paint directly from nature. Nature’s processes of transformation and renewal seem to embody the complex narratives of life, the balance and paradox of pain and pleasure, love and loss. I invite you, your family and friends, to join me at the opening on Saturday 10 November at 2pm to celebrate these new paintings and the remarkable places that inspired them. Click here for further information or to receive an email invitation. Thank you, I look forward to connecting with you in the future. Thank you! I look forward to making contact with you via email.